Back in the 1960s and early 1970s, every woman knew how to tie the sari. It is just a long piece of material, of around eight metres in length and 1.2 metres in breadth. But when worn around oneself, it will even turn any woman into a lady, the epitome of grace. Yes, the sari is indeed a graceful dress. It has many advantages such as suiting and fitting all figures. Short women can hide their high heals behind the fall of their sari. The blouse can be long-sleeved, half-sleeved or sleeveless. The pallu may also be pulled around the shoulders and used to cover the head. Back in the 1960s and early 1970s, every woman knew how to tie the sari. The tailors stitched more blouses and petticoats than shalwar kameez. Then in the ’80s they came up with the stitched sari, where they would gather and stitch the pleats and add a hook on the side to make it easier to wear. 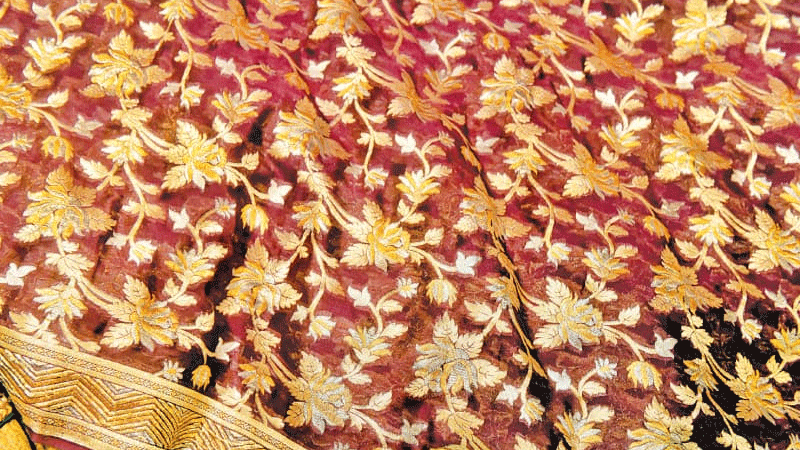 A heavily-embroidered Chiffon sari. / Photos by Fahim Siddiqi / White Star. Hence the time it took to wear the dress was cut down. You just put on the sari like a long skirt that you could tie on the side with the hook and pin the pallu on one shoulder. This was when there was also no fear for those not too confident to carry the dress of their sari coming undone and opening up. Still, the traditional wearers wouldn’t dream of doing this to their sari. They said it would kill the grace and turn the sari into a ghagra. Sadly, the sari is going out of fashion these days. 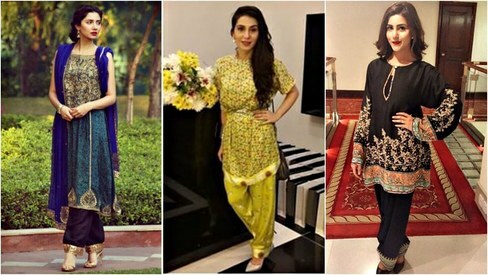 Women would rather wear shalwar kameez, which they feel are far easier to manage, and graceful as well, or the gharara or ghagra, which have recently made a comeback. But what about the sari? 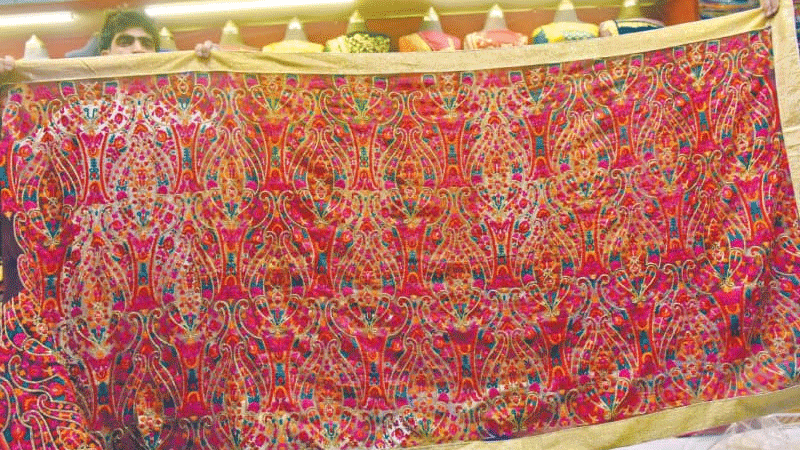 “What about it?” asks Khalid Mehmood of Adamjee Silk Corner at Mahboob Cloth Market, one of the biggest markets for saris in Karachi. “There are many who still like to wear the sari. And surprisingly,” he says, “it is the youngsters.” He says he gets many young women in their twenties and early thirties wanting to buy pretty saris, who are inspired by the photos of their grandmothers in old family albums. “And wearing it with such grace, they do this dress proud,” he smiles. About who else buys saris now other than young women, he says that earlier he had many Hyderabadi women as his regular customers. “But now I also have a lot of Ismaili women who prefer to wear the sari at social gatherings,” he says. 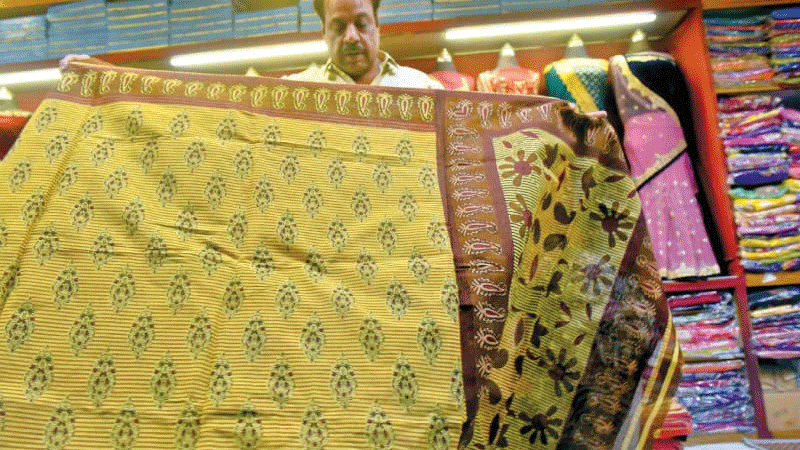 The market has a variety of saris. 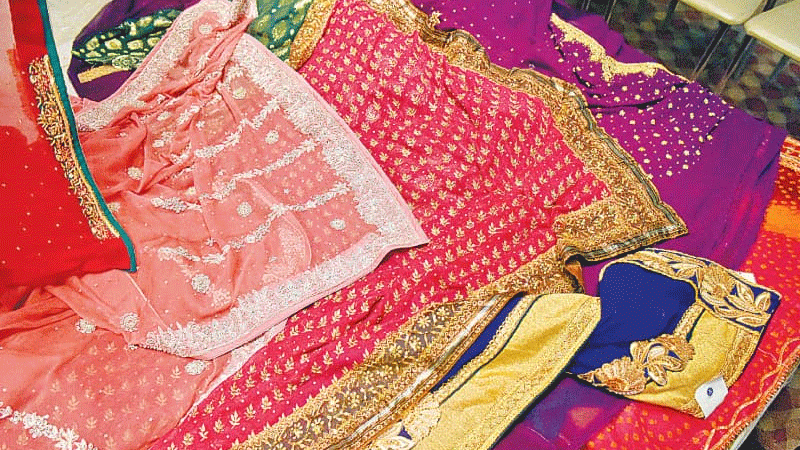 There are salesmen standing up to model bridal chiffon saris starting from as low as Rs5,000 to as high as Rs30,000. 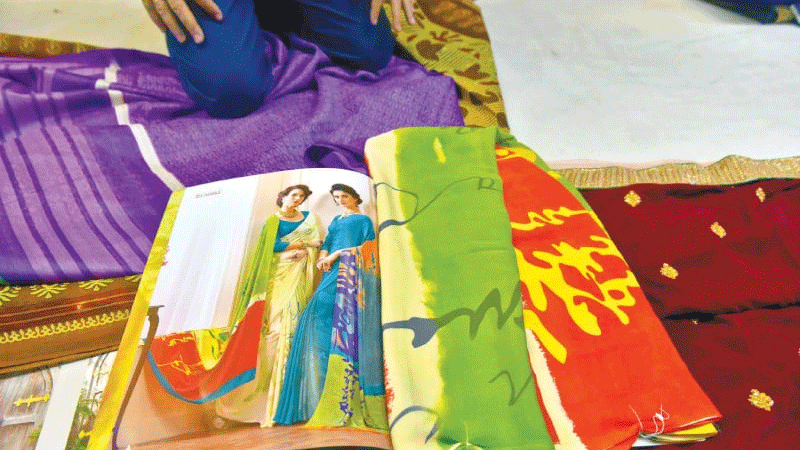 Other varieties include the Banarasi sari, the Indian silk saris, the designer with net fall and velvet pallu, the Bangladeshi cotton saris, the Mysore sari and what not. The men modelling the saris particularly show off the pallu, the most decorated part of the dress as they rest their hand on their waists. It is a bit funny watching these men with mustaches donning the saris. The shopkeepers are also very clever as far as the cost of a sari is concerned. “I will begin with Rs12,500 and then come down to as low as half of that,” says one. “I do it because the women here love to bargain. If I give them the real price right away, they will try to bring it down, which will result in a loss for me, so I leave a margin,” he says smiling. So there they are, sari shoppers, the smart ones walking away with purchases of Rs3,500 even and the naive ones buying the same thing for Rs8,000 or Rs10,000. Saree is one of the most elegant dresses on earth. Hope more women take to it. Sari is royal, beautiful and exotic dress. Sari can't be out of fashion.Every woman wants to be goddess. Sari is a very elegant dress, and can never get out of fashion. 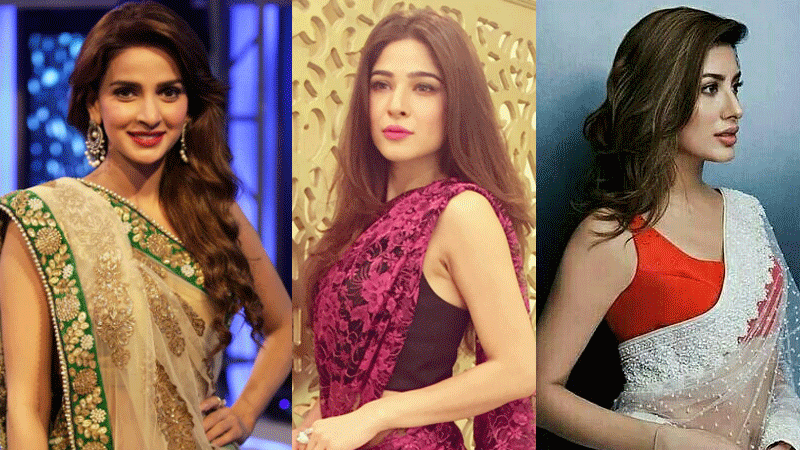 I think 5 % or less karachi and 10% of hydrabad women normal dressing.but totaly 0% n northrn Pakistan. i remember the times when we learnt to wear the neck-tie knot at jr. school. i still remember it today. but perhaps, the adolescents & youngsters of today, look around for help, in order to tie the neck-tie knot. looks like, the same applies for the sarri. young girls seem to have forgotten how to wear a sarri in place. Modern designer dresses left sari far away in past. Women can wear modern dresses in events social gatherings and offices. Not Sari but Shalwar Qameez has always been a formal and casual dress of the women of the Indus Valley. Sari was basically brought by the Indians who had migrated to southern Sind after partition. Now even they have shunned it in favour of shalwar qameez - which is more elegant, comfortable and practical. @Temur : Comfortable and practical, yes, but more elegant? @Khan : Anything but cheap. Your irrational prejudice shows through! Saree... it's not fashion... it's culture and tradition. It's best dress from past to future. Saree are here to stay and it is most beautiful outfit a woman can wear. Some woman cannot properly wear it and carry on with it. The ordinary looking looks the most beautiful women wearing a sari in a proper way. Neither Salwar kurta or any other attire can match 'SARI'. Saree is for those who understand the culture behind it, not for those who oppose it, for whatever reason. I am so sari the saree is no more !